During the summer months, seniors will likely want to take advantage of the warmer temperatures and sunshine, but as a provider of elderly home care services, it's important to remember that the heat and sun present dangers to older adults. Go swimming: If your clients enjoy being in the water, they can get some physical activity while also enjoying the warmth of the sun swimming laps in a local outdoor pool. The water will keep them cool, but be sure to remind them to wear waterproof sunscreen. 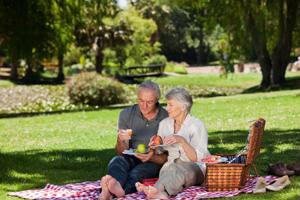 Have a picnic: It can be fun and relaxing to have a picnic lunch in the backyard or a nearby park. Help your client pack sandwiches, snacks and plenty of water, and recommend that he or she wear a hat and loose, light-colored clothing before dining al fresco. Plant a garden: If your clients enjoys working outdoors and growing their own fruits or vegetables, you can encourage them to plant a garden. It's best for them to plant under or near a tree that will provide shade. Suggest that they work in the morning or evening to avoid the highest temperatures.